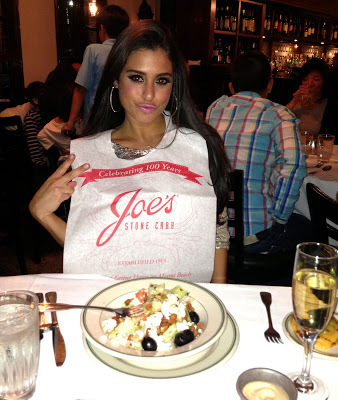 I finally went to the famous Joe’s Stone Crab in Miami Beach! I have been wanting to go there for ages, and this New Years Eve, I got VIP treatment, skipped the two hour wait and got seated right away lol! You may have heard of Joe’s, it’s been featured on TV food shows and is quite famous in Miami…..if you love crab and/or seafood Joe’s is a must! Be prepared to wait though, it’s always busy….check out what I ate at Joe’s below! Light and flavorful. I loved the honey-roasted peanuts in it, it gave a unique twist to the “ordinary chopped salad”. The dressing was a light vinaigrette and I loved the richness of the feta cheese chunks mixed in. It was a good chopped salad and a perfect starter to a great meal. I’ve never had anything like this before! It was a warm grilled tomato with spinach and melted cheese on top. It’s also a great appetizer before your meal. Who knew spinach and melted cheese on a tomato would work so good! I don’t even know what was in this concoction of goodness but it was delicious! It was cheesy, fried, flakey, creamy and had a bunch of different seafood all stuffed and baked on top of a clam shell. I would definitely recommend this as an appetizer. Super flavorful and so good! These are the famous Joe’s Stone Crab claws! They come chilled with lemon & a mustard cream sauce on the side to dip. They were meaty and amazing. You can taste the freshness and quality of the crab, it had great flavor. I could eat 10 plates of this to myself lol. I loved it! This was on another level! I never order key lime pie but now I am going to start. It was amazing. It was tart and sweet, rich and creamy and I loved the pie crust. You have to order this as dessert even if you are full lol, this pie is famous! MY SPARKLY ATTIRE AT JOE’S STONE CRAB LOL, NEW YEAR’S EVE IN MIAMI!!! I can’t wait to go back again at Joe’s soon. I loved it! It’s a must if you are in Miami, and even worth a wait!